North of Narrabri: The End. . . for now. The End. . . for now. Not the beginning of the end--rather, the end of the beginning! 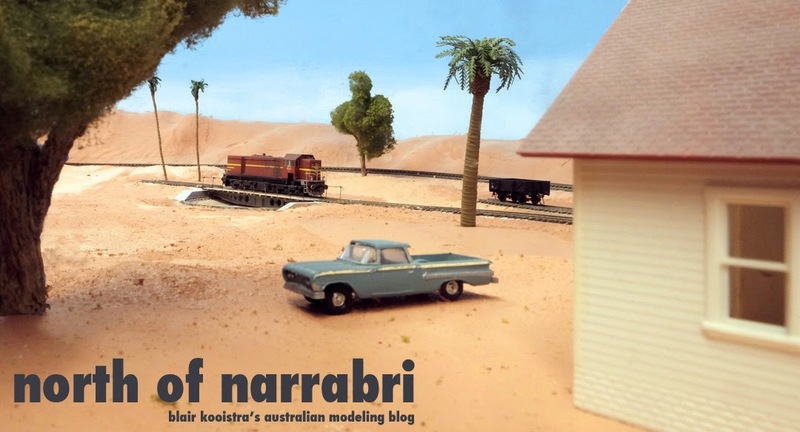 The End of a Model Railroad is rarely something to celebrate, and the case of North of Narrabri is no different. Readers of this by-now semi-annual blog about building North of Narrabri have well noticed the lack of updates; those times I have updated in the past few years, it's mainly been to assure my dwindling number of followers that I'm still in the game, just not working as intently as I did before. So with the deepening layer of dust on the layout from lack of use, inspiration and progress (measured at 115 scale centimeters at last count), it became obvious that as time went on, it was becoming tougher and tougher to get back on that modeling wagon without some big lightning bolt of inspiration to bring me back in there. My kids had largely taken over the train room, which I don't really begrudge them, as one of the early tenants of the layout's design was to open up the room for use by the rest of the family. In the past couple of years, though, other interests in my life have emerged to edge the modeling from priority status. We did a bit of remodeling of the house, which certainly diverted time and money from the model railway. Last November I acquired a 1966 Ford Thunderbird, which while not needing much work at all, called me either to the garage downstairs to troubleshoot the constant little nags, or to the open road to enjoy such a vintage piece of Michigan Steel. And lastly, the acquisition of a new, smaller, lighter mirrorless Fuji X-series camera system has rekindled one of my earliest loves: photography. It was my photography interest which grew as a result of my initial railway interest in the mid-1970s, and eventually provided me 10 years of employment as a photojournalist. But photography for the sheer pleasure of making images of things that struck my eye became less and less of an occurrence once I left the profession to become a railroader in 1994. Since starting a family, the only times I went out of my way to make photographs were family events or for railroad photography--and apart from trips to Australia in 2009 and 2012, I'd done very little of that. The Fuji cameras made photography fun again, and I'm fully vested in once again exploring my visual creative side. Stifiling my layout progress were a couple of issues: the age of my DCC system (Easy DCC from around 2000), the unresponsiveness of CVP, the system's manufacturer, to respond to requests for help on upgrading the system; and the continued delay after delay of TrainORama to deliver three 48 class I'd ordered in February 2008. True, they're ONLY locomotives, but this was a layout based on Narrabri, and without the signature locomotive on the railroad. . .well, it just wasn't motivating to not be able to run a full program of trains on one of my rare operating sessions. So, I decided to start anew. I might be back working on a layout early next year, or it might be a few years. I'm not going to let a hobby pursuit drag me down. It'll happen when it happens. In the meantime, I can scale back some benchwork, remove other portions (and repair holes in the drywall I'd punched to situate a helix), and just not worry about model railroading for awhile. 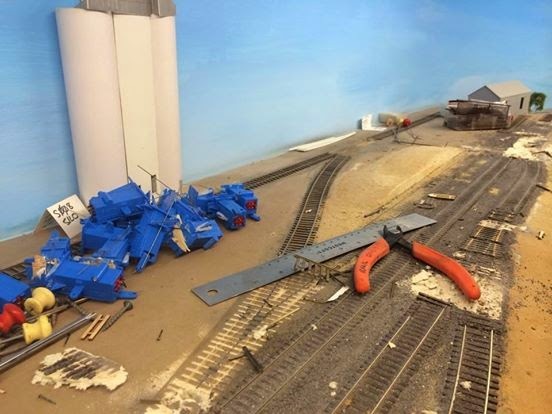 The 40-or-so hand-built turnouts will likely be recycled on Lance Lassen's Tocumwal layout; I'll be thinning out my rolling stock collection by about 40%. And I'll get on with these other pursuits. What might replace Narrabri? I'm leaning towards a streamlined, one-town layout that will extend along two walls of the existing railroad room, with a benchwork around 50cm deep. I'd imagine it being a mix-up of Coonabarbaran and Wee Waa: a modern high-thruput grain operation, the older concrete silos "downtown." A traditional stock, loading bank, goods shed arrangement. A small passenger station with thrice-weekly 620/720 service. A couple of oil spurs. A siding for containerized cotton. And a weed-grown loco servicing facility with small armstrong turntable. The era will be the same as Narrabri was: mid-1970s to 1980. Hopefully, but the time I get back to this new layout, those 48's will have arrived--from TrainO, from Auscision--hopefully from someone. So, while this is an ending, it isn't THE END. It's just a break. And when I come back to it, it'll be fun and exciting and something I will devote the time to. Thanks for all your interest in North of Narrabri! Your own work has served as an inspiration for me and a benchmark to aim for. I am certain that my family will consider a saying for my grave stone...as this one statement has guided me through the hobby for many years and that is " If it becomes a chore...then it ceases to be a hobby"
I struggle at time for the balance of family, work, life and the hobby and I also find that my "in hobby" interests have changed over the years and my thoughts of an operational empire have given way to the satisfaction of building smaller structures and mini dioramas. Please keep in touch with the downunder brigade and we will keep an eye on your other interests through Facebook. Sad news but I completely understand how you feel. It was great to be able to see your layout in person. Next time I get to the Bell Academy you may have a new layout to see! Even Michelangelo had his moments Blair. When the creative streak is no longer there and other interests over ride the hobby, then you must follow those other interests until the hobby bug bites again. And it will bite at some time in the future - I guarantee it will! For some reason this comment ended up on the previous page, so just to ensure you got it need to repeat. Sad to read your demise, at least lets all hope its but temporary & whether its a few months or a years, it will be good to hear again of your expoits. The sorrow of delays to certain models is sometimes disheartening but I understand the 48's will be here sooner rather than later, which many are looking forward to along with many other models. Have a good break & come back refreshed. Blair, I think most of us know how you feel...I remember my own hiatus of more than ten years, after which I got fired up again with renewed energy and a completely new theme, and I mean completely , from Central European mountain railways to Victorian branchline... that's some change :-).. Good luck to you and ... you'll be back ! Email on the way but I must express my hope that you will come back stronger than ever. At least you have a plan for the next layout and that should pull you through. Enjoy the Thunderbird, I know what a fun and frustrating thing they can be as I own a 1961 Holden EK, similar to a 3/4 size combination of a 56 and 57 Chevrolet. Emerging from a cloud of (probably toxic) dust.